Val Thorens is located at an altitude of 2300m earning it the accolade of Europe's highest ski resort. With altitude comes snow and not only does Val Thorens benefit from large amounts of the good stuff, but many of the slopes are north facing giving great piste conditions. The snow sureness of Val Thorens means it opens earlier and closes later than other resorts, normally running from mid-November to early May. 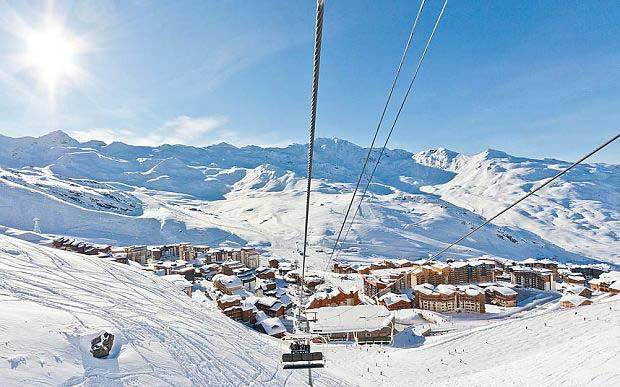 Linked into the The Three Valleys (Les Trois Vallées) ski domain, Val Thorens is part of the largest ski area in the world and is less than a thousand meters below the skiable peaks of the Pointe du Bouchet 3220m and the Cime de Caron 3200m. With a world class snow park, that annually hosts freestyle competitions, and a ski cross arena named after local ski cross legend Jean-Fred Chapuis, Val Thorens really is a world-class ski destination. At under fifty years young Val Thorens, like many of the Tarentaise Valley resorts, was built with little regulation of building style. The result was many concrete structures now considered to be on the wrong side of beautiful. But, with time, the buildings have undergone redevelopment and, as with new constructions, have had to meet strict regulations of style and building materials resulting in a more attractive ski town. Ultimately Val Thorens is a world in itself. A plethora of high class hotels alongside apartments all a stones throw from the varied pistes and within walking distance of the bars and restaurants lining the snow covered streets. Val Thorens has a unique vibe, two-thirds of visitors are foreign with an abundance of British, Dutch, Belgian and German holiday makers. As the large banner that greets you at the entrance says, 'Welcome to the United Nations of Val Thorens'. Val Thorens' sixty-eight pistes run from a dizzying 3220m to 1850m in altitude. But don't think this means they are super challenging, almost eighty percent of these are blue or red runs, making it a haven for intermediate skiers and boarders. The remainder is split between black and green, eight pistes of each. And off the pistes there are countless opportunities for advanced skiers. Beyond Val Thorens the pistes link seamlessly in to the 600km domain of The Three valleys. Therefore there is no shortage of piste for any level of skier. In The Three Valleys 16% is green, 40% Blue, 34% red, 10% Black all accessible under the Three Valleys lift pass. Val Thorens ski passes for 2018/19 are €256 for 6 days or a Three Valleys 6-day ski pass is €306. Further options and prices can be seen here. In Val Thorens there is a large beginners area between the Roc and 2 Lacs lifts. These nursery slopes have 4 (free to use) magic carpet lifts for those whose first time it is on the snow. The progression is safe and exciting as out of the nursery area the exploring begins. Gentle blues link the valley areas together, meaning beginners are not limited to one area or single piste. The Cairn piste heading to Les Menuires is a notable wide and smooth blue leading to the narrower but even less steep Boulevard Cumin. Then it is only a couple of lifts and a choice of blues back to resort. Both Val Thorens and The Three Valleys network is over 75% blue and red runs, meaning exploration is the name of the game. Keeping within Val Thorens? Find your 'ski-legs' and warm up on the Moraine and Genepi blues from the Moraine lift then perhaps head to the Grand Fond cable car up to 3000m and a choice of blues and reds heading back to Val Thorens. Heading out of Val Thornes try the Boismint chairlift to access a number of popular red runs towards Les Menuires. There is no shortage of challenges and leg-burners in Val Thorens. Four peaks surround Val Thorens and offer up varied terrain. Try the infamous Combe de Rosael that often has a huge mogul field. Or if you are after some fresh powder tracks a good place to go is the Bouchet lift towards the Orelle valley, where the pistes are wide and quiet. Alternatively try the Point de la Masse for four challenging black runs. Or head over to Courchevel for some of their notorious couloir action. Early season skiing on super quiet slopes. The resort, South facing sunshine and close to the piste accommodation. Combe de Rosael, Mogul madness on this piste. Frog and Roast Beef, The highest British pub in Europe! We offer private transfers from Geneva, Grenoble, Lyon, and Chambéry airports to Val Thorens in professionally driven modern vehicles. Relax in comfort and safety or upgrade to our Business Class and First Class services for even more luxury. Val Thorens to/from Geneva, Lyon and Grenoble airports in 3hrs and Chambéry airport in 2.5hrs (subject to weather and traffic). Visit our transfer routes page to familiarise yourself with the route, however you travel. Comfortable VW caravelles for 8 people. First Class and Business Class Services. Free child seats and boosters on request. Please visit the booking form to get a competitive quote or enter your destination in the quick quote form on this page. Mountain Rescue HQ will reply with your travel details and a secure online payment request. HQ will send a booking confirmation on receipt of payment. Mountain Rescue Transfers is a french registered transport business, licensed and insured to carry paying customers in France and Switzerland. Tourist Information Office: What's happening, when and where. Piste Maps: Lift opening and piste guides. SeeValThorens: Discover more about Val Thorens. Chalet Le Sommet: 28 person Chalet in panoramic location at the top of VT.
Chalet Catherine: Superb ski in and out chalet. Hotel Pashmia: High luxury at high altitude. Sensations: All inclusive hotel with entertainments. Le Val Thorens: Trendy Alpine lodging. Fahrenheit Seven: Great location and a relaxed atmosphere. Val Thorens Apartment: Studio apartments to rent. Résidence Maeva le Gypaète: Slope-side apartment rental. Résidence Village Montana: Cosy ski-in/ski-out apartments. Zenith: Independent boot fitting specialist. Skimium: A choice of local outlets in VT.
SkiSet: Get set with Ski Set. Snowshoeing: Magical walks in untouched snow. Yoga: Recharge and refresh in the mountain air. Toboggan: Possibly the longest toboggan in the alps. Enquire at the tourist office. Audi Ski Cross World Cup: Annual world class ski cross in Val Thorens. New Years Eve: Free New Year event with torchlight parade and fireworks. Ski and boarder week: Demos, parties and competitions. Australia Day: Parties, fancy dress and all things Australian! La Folie Douce: The original Aprés-ski bar! La Pause de Pierrette: Fresh products in modern cuisine. Le Malaysia: Possibly Europe's highest nightclub. Alpine Childcare: Links families with nannies and babysitters. ESF: French childcare service in VT. Ski Nanny: Local child care service. Mountain Biking: Mountain biking fun in the summer. Multi Activity Card: Access over 25 summer activities in VT.
Sports Centre: Well-being and relaxation. Paragliding: Take to the summer skies.